One of my favorite Norwegian festivals is Midgarsblot. This year is the third year for the festival, while my second visit. 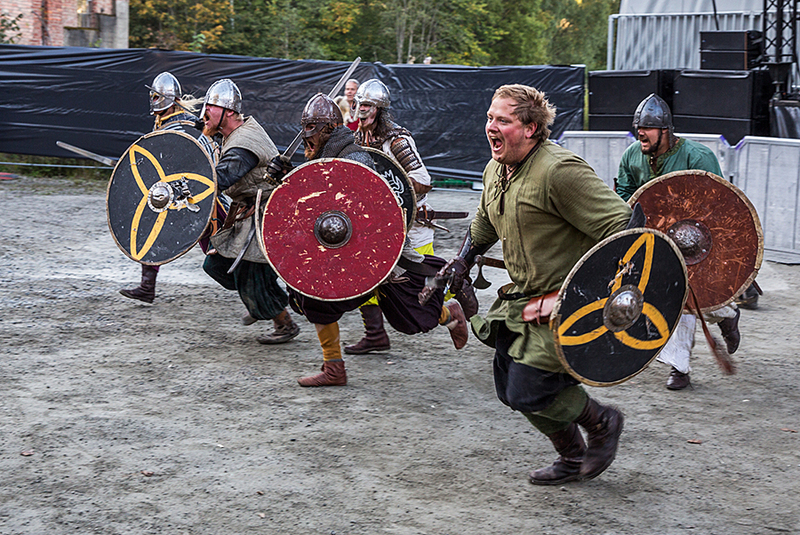 The festival is held at Borre in Vestfold, surrounded by tumuli, or grave mounds from the viking age. At the festival site there is a replica of a mead hall, where the vikings feasted, so you can’t get a more viking inspired venue for a festival that combines vikings and metal in many different shapes. Two years ago, Eidsivablot was held at Eidsvold, the same place where Norway’s constitution was made 200 years before. It is also one of the places where the vikings held their blot, a pagan party with eating drinking, games, and worshipping of their gods. Borre, south west of Oslo is another place where the vikings held blot, and they have built a museum and a house in the style of the vikings. This weekend the second edition of Midgardsblot was held there. Enslaved is one of the most long lived metal bands in Norway. This year they celebrate 25 years together as a band with concert dates in Norway and Europe. The band was formed by Ivar Bjørnson and Grutle Kjellson from Haugesund, and they are still with the band. So far Enslaved have won four Spellemann awards (Norwegian Grammy), with three more nominations. Last night they celebrated their first 25 years at Rockefeller in Oslo. The year 2014 marks the 200 year anniversary for the Norwegia constitution and our independence from more than 350 years under Denmark. There have been many celebrations during the year, and this weekend marked the end of the celebrations, with – among other activities, the festival Eidsivablót. A blót is a pagan ritual to the Norse gods and the spirits of the land, and was celebrated by the Norwegian Vikings 1000 years ago with sacrifices, food, drinks and a party. The 2014 version of the blót had viking games, food, drink, and party, and instead of sacrificing animals, we got concerts by Wardruna and Enslaved, plus Skuggsjaa.